Marking what appears to be the end of the second act of Lara’s rebooted explorations, Cold Darkness Awakened really had a lot to live up to. 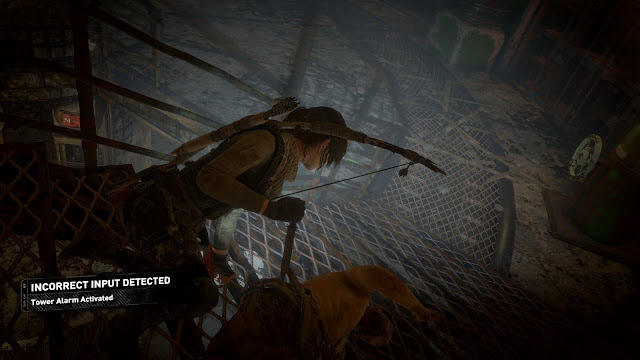 Not only was Rise of the Tomb Raider a great game, one of the best of 2015 in my opinion, but also the two previous add-ons; Endurance, a surprisingly fun and fitting challenge mode of sorts, and Baba Yaga, Temple of the Witch, a bite-sized chunk of Lara doing what she does best. Cold Darkness Awakened in many ways, fills an awkward middle ground between the systems-drive Endurance mode and the story-driven Baba Yaga, and does so poorly. Accessible through the expeditions menu, Cold Darkness is a standalone experience, with challenges, scoring, and card slots. The loading screen features narration by a Soviet scientist who, in an effort to create super soldiers, ended up birthing zombies. No, I’m not paraphrasing for comedic effect; there is no illusion to anything less rote. It is impossible for me to know for certain of course, but the dialog would not be entirely out of place if it was split across audio logs, like those found in the campaign. That format facilitates deeper exploration of the concepts at play, in a rewarding breadcrumb manner, whereas the loading screen dump is shallow and more than a little jarring. And that’s not the only reason I think Cold Darkness was at some point intended to be a more fleshed out, campaign-integrated story mission. 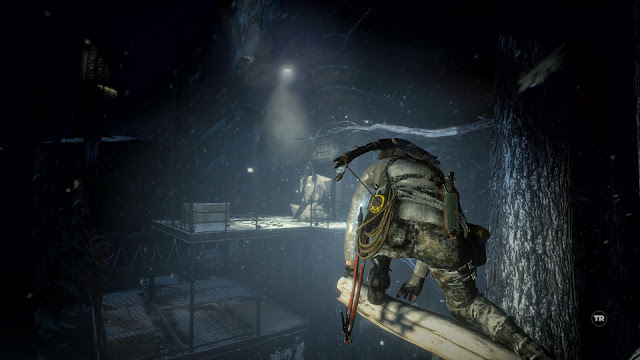 When the gameplay begins, you get a smidge more narrative courtesy of Nadia and Sophia, two notable characters from the Baba Yaga and base game, respectively, as Lara is dropped into a Soviet facility. However, the dialog is written to imply that the zombies – I don’t believe they ever actually use that word – were a problem before arriving at the Soviet facility, and that the toxins apparently spreading in the air that Lara knows so much about need to be stopped. ‘What zombies?’, and, ‘which toxins?’, would both be fair questions to ask at this point. The answer Cold Darkness Awakened gives, is in short; the ones you’re going to shoot, now hush and climb this tree. The one area, a Soviet facility, is a fairly large one; it is also virtually pitch black, save Lara’s torch beam and that of the helicopter overhead – why yes, the two medieval valley-dwellers can speak perfect, unaccented English and pilot a helicopter. And infested with ‘infected’ Trinity Soldiers; zombies wearing trunks no Trinity mercenary ever wore in public, equipped with knives and other assorted non-firearms. These zombies swarm the area and respawn constantly. Fortunately, their eye-sight is terrible and they won’t respond to the direct light or Lara’s torch until they are within a meter or two, but they boast comparatively keen hearing. The gibbering infected are fast and deadly; on the normal ‘Tomb Raider’ difficulty, Lara can be killed in just a hit or two depending upon the type of zombie. 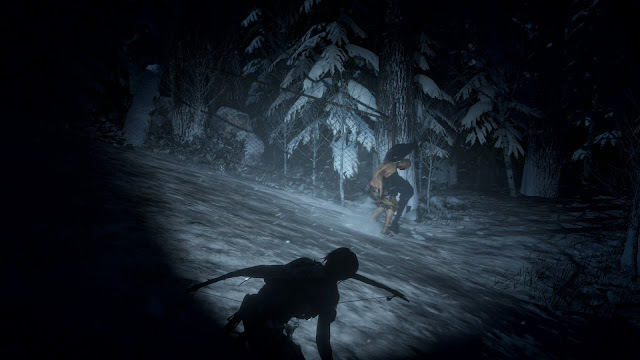 Curiously the larger infected, the armoured variants, seem to ‘die’ in a single body shot from the revolver, while the bare-chested common ones may take two or three, encouraging headshots. Bizarrely, some run at you with live explosives, not only odd from a ‘lore’ perspective, but totally unnecessary from a gameplay standpoint, given the devastating close range attacks of the normal zombies. Additionally, I’ve seen multiple instances of them glitching through objects, sometimes because of something I’ve done, other times completely of their own volition, in the case of one zombie that teleported on and off a head-high ledge repeatedly while on patrol. In the large open area, weapons can be scavenged and prisoners freed. All the prisoners are women; there is a throwaway line about women not being infect-able, solving the quandary of Lara’s necessary immunity, and potentially halving the number of enemy character models that needed to be created. It is not a fun place to be in though, which is the real issue; you can’t see enough of the environment to fully game and conquer it, and the numerous enemies simply aren’t rewarding to fight, especially in such large, unwavering numbers. Cold Darkness Awakened simply doesn’t use the environment, or any of Lara’s traversal skills to good effect. 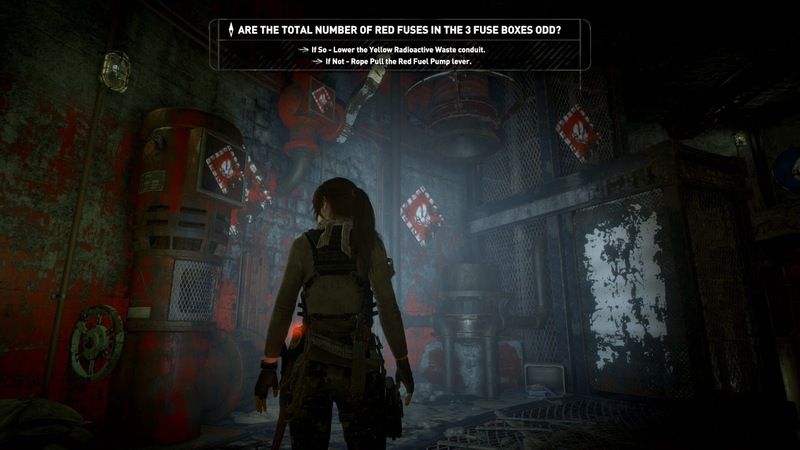 To stop the infected, Lara has to fiddle with three virtually identical stations across the map. Once inside the first, the women on the radio will explain that red paint and a flame symbol means flammable, that blue and a water drop means water, and so on through all four types of coloured objects. Not only is this insulting to the player’s intelligence, their ability to puzzle out anything in the environment, it is unreasonable that these totally isolated village dwellers would be able to read a manual – who knows where that came from – and equally, that Lara couldn’t distinguish between a water and fire symbols unaided, but more over it is completely unnecessary. There is no functional difference between the water or radioactive material pipes or levers, except colour and symbol, the mission text which we’ll discuss shortly, only ever mentions colour, making the reprehensible cutscene explaining each type of pipe entirely redundant. It is not even a well-considered accessibility aid for people with colour blindness, so far as I can tell, because the use of colour in the mission text requires the player to distinguish colours anyway, or at least remember the matching symbol and colour. A series of tasks are given by the women on the radio, such as; if there are there are an even number of red fuses in the three fuse boxes, lower the blue conduit, else crank the green lever. Good luck finding any of the above items in the multi-storeyed, shadowed silos, patrolled by the worst enemy type in the whole game. If you get one of the riddles wrong, the building will flood with zombies for a minute or two. After dealing with three such stations, it’s on to the big facility in the middle, where Lara has to shoot half a dozen pistons and try not to die. That’s it. Game Over. You could, theoretically, play it again on higher difficulties, complete challenges, and spice up your time with cards, but it certainly doesn’t earn that much of the player. Cold Darkness Awakened is an experience that manages to abuse just about every aspect of the Tomb Raider formula that it lays its dirty claws on. The narrative, such as it is, seemed disjointed and patched together, rather than simple scant, while the gameplay is actively bad. 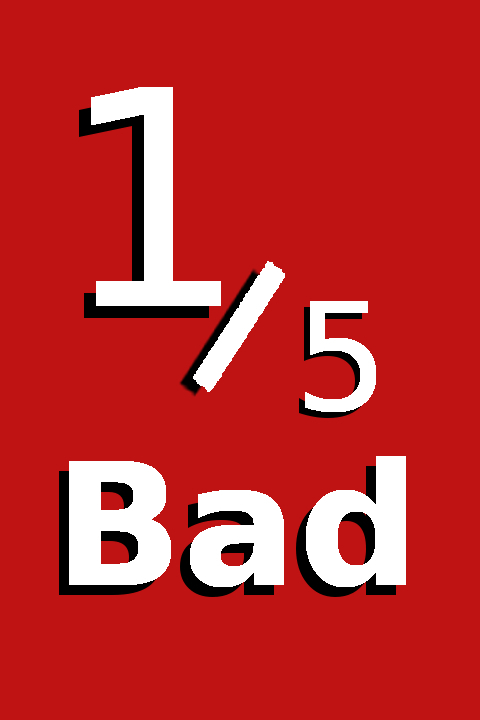 Ill-conceived and disappointing all around.